Ewa of Delishhh asked me if I knew anything about the Thermomix or the Pacojet. I had never heard of them, so I visited their sites. The Thermomix looks like a multi-faceted appliance. It makes me think of late-night “info-mercials”: “it slices, dices, chops anything and everything!” Perhaps it could replace a blender, food processor, bread maker, wooden spoon, etc., but I really cannot comment further. As for the Pacojet, it does look like a fun contraption for freezing food for future consumption and for making frozen mousses, ice creams, and drinks. The Swiss-based site oddly refers to “Veal Farce” and “Farce of Fresh Salmon”. While I am familiar with the French culinary technique and terminology, reading the references in English made me think of Restoration comedies or the French dramatic farces of Georges Feydeau. I picture salmon wearing full-length dresses on stage, with petticoats, feathered hats, and lacy parasols, in plots of mistaken identity and infidelity. Does anyone have any hands-on experience with either of the new products? My salmon in soy-maple-ginger-garlic glaze is not a farce, I hope! The holiday season is the best time to review etiquette for guests at dinner parties. Can you imagine a better source on proper conduct than Emily Post herself, from her own “Institute” in Sandy Hook, Connecticut? My favourite part is well into the video, at 6:35 when Ms. Post expounds on how to eat cream-filled desserts with a spoon and a fork. It is even funnier, at 7:30, with many examples of major faux pas. These days, I cannot imagine anyone smoking at a dinner party – much less blowing smoke in the face of a dining companion. I want to give a “shout-out” to Gera for his site, “Sweets Foods”. Gera offers a wealth of information on the wacky wide world of social media and a round-up of food blog posts, sweet and savoury. Check out Gera’s weekly synopsis of helpful articles for us food bloggers – and others – coming to the world from Uruguay. Thank you, Gera! 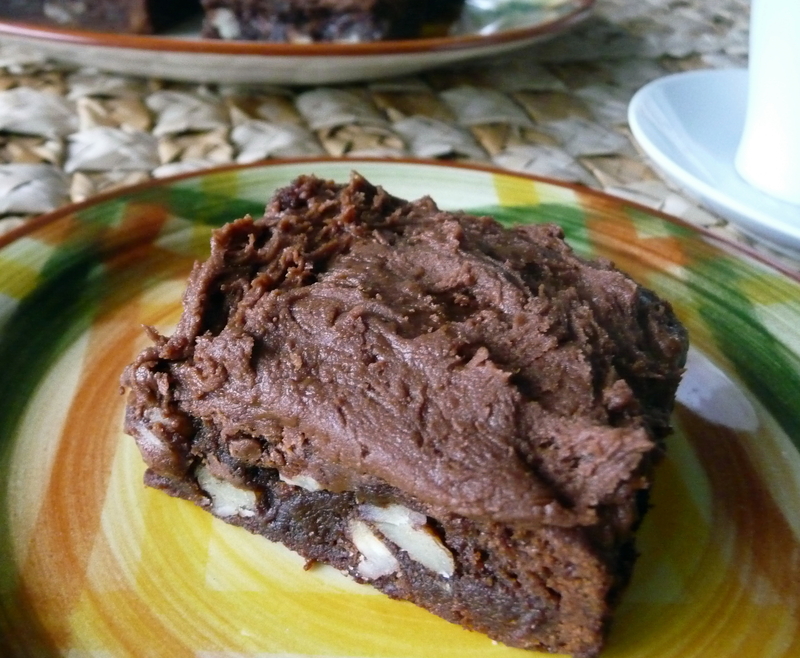 This entry was posted in Blogs and Food Writing, Brownies, Friday Food Fun and Facts, Seafood and tagged Brownies, food blogs, Food news, national food holidays, salmon. Bookmark the permalink. Sorry, I don’t know what a “noodle-ring” is; I’m curious, too! Loved the Emily Post video! Hi, Kath. I wonder why the “noodle-ring” is worthy of a national holiday. Some day we will have the answer…. Salut, Pierre. Bien sûr, tu as raison. Les Français aiment célébrer la nouriture chaque jour. Cependant, en amerique du nord, on doit créer les fêtes pour certaines nouritures…. I love your practical view of these kitchen gadgets, maybe its the economy but I’ve become more aware that I do not need the latest dodad to get stuff done. That being said, my understanding of the pacojet is that it produces ice creams and sorbets with superior texture than can be achieved with other home gadgets. Your salmon dish is far from a farce and looks just delicious. As to the shout out for Gera, totally agree. Just an incredibly gifted and generous individual. Thanks, Louann. I appreciate your compliments and insight into the Pacoject (though I totally agree about not needing more and more electronic contraptions). Thanks a lot for the mention of my weekly roundup and really it’s a pleasure to try to share worthy-articles frequently to other bloggers. All the best and Thank You again Dan! No, really, thank you, Gera! I think you can celebrate all these food holidays in Uruguay or wherever you may go. Why not? What an informative post, thanks Dan. Your salmon recipe sounds magnificent and I love that your kitty made an appearance on that post. Hi, Mandy. I think these holidays are a (North) American marketing strategy, primarily from the U.S., I’m sure. Perhaps you can start your own food-related ones in your area? I try to sneak in the cats, when I can find a connection – as tenuous as it may be (they like salmon, too, of course). Hi Dan, thanks for the list of national food days. I think I will make a seafood bouillabaisse for dinner tomorrow. Noodle ring? What is that??? Maple salmon sounds divine. Thanks, Geni. I am glad you’ll be celebrating National Bouillabaisse Day. Good for you! Maybe we’ll discover the origins of the mysterious noodle-ring some day – or maybe it’s an evil gang of pasta-lovers?? So intrigued by this ‘national noodle ring’ day and yet completely confused by it, I decided to Google it. It is, apparently, a German dish which looks like a bundt cake but is in fact made of, er, noodles. All rather disturbing, and yet I now feel that I MUST make it… I’ll report back with findings! Jax, I am counting on you to lead the way with National Noodle-Day celebrations. While German, it sounds suspiciously close to kugel, which is a traditional middle-European Jewish dish, savoury or sweet (I have my grandmother Jessie’s recipe for this one). I’m a little scared to hear what people cover in chocolate tomorrow…and I must admit I snorted a little bit when I read “farce of fresh salmon.” 🙂 Love this! Thanks, Maddie. Why are there so few Restoration Comedies featuring dolled-up salmon? On the chocolate-covered front, I will have a rich recipe for tomorrow…. Dan, I’m beginning to think some of these holidays were conjured up by someone suffering from boredom with a dash of ho-hum. But, as long as it involves chocolate, well then, hip, hip, hurray! Your salmon dish looks perfectly succulent! I try to serve salmon at least once a week, and I normally just pan-sear it, because I’m often too tired from work to be creative. But, I believe your salmon recipe just gave me the incentive I needed. Btw, I believe your double chocolate brownie just winked at me—I’m in love (and a little disturbed by it. But I’ll get over it). Hi, Sol. Of course, the brownie winked at you – it is doubly-malty (and Whoppers are Malteasers in England, so the malt is teasing and taunting you…besides, don’t brownies always wink in their sassy way??). The food holidays are a bizarre assortment, and I can’t figure out how or where they originated. My guess is that there from the US, and Congress approved them all, back in the day legislation seemed to be easier to pass…. 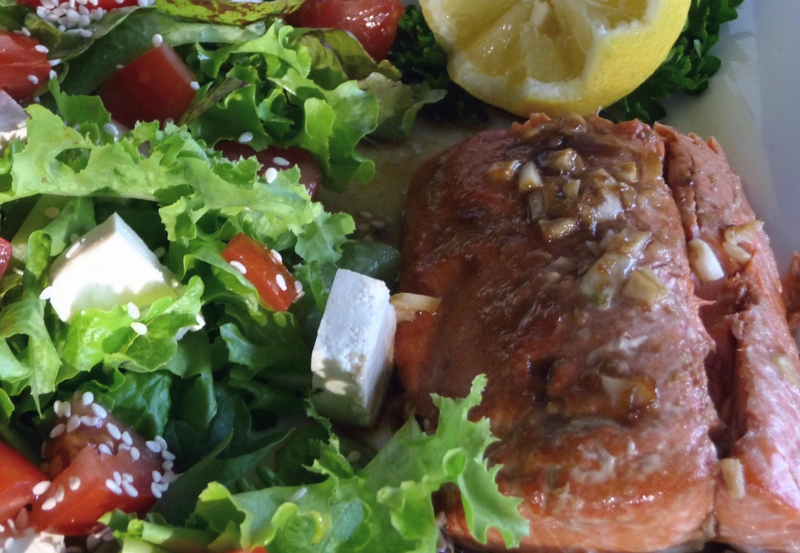 Let me know what you think of the salmon, if you try this version!